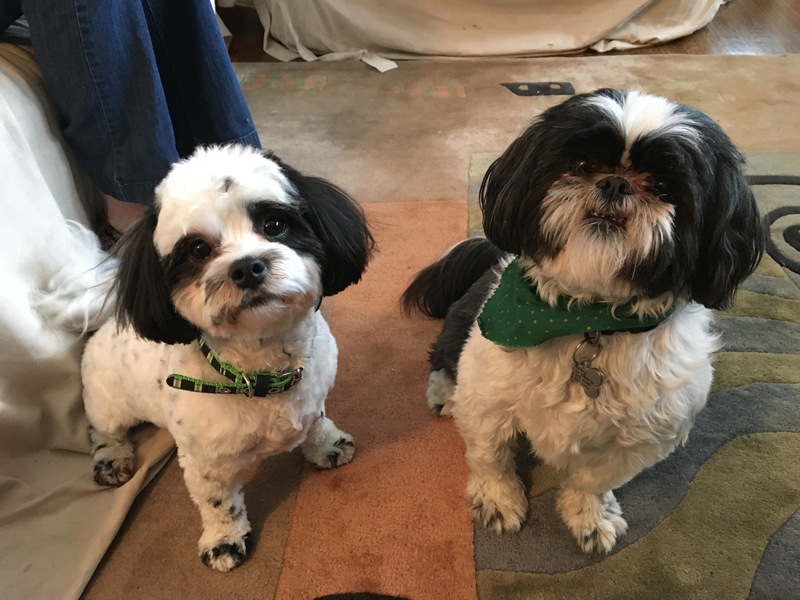 Kevin (left) is a one-year-old Teddy Bear who lives with severn year old Shih Tzu Bailey (right) and an elderly dog named Bob (Not pictured). Their guardians called me in to help with Kevin’s habit of nipping or biting humans or dogs when he is corrected, barking at guests, not listening, chewing inappropriate objects and charging when people knock on the door. Because of Kevin’s habit of accosting visitors, his guardian had gotten into a habit of picking him up when she answered the door. When dogs live in a group, security is typically handled by the senior ranking dog or authority figure. So Kevin’s door behavior told me that he believed he had a position of authority in his family. To help chang the dog’s perception of rank, I went over a number of structural changes his family can make that will help the dog start to see them as having more rank than he does. Petting with a purpose, setting and enforcing rules and boundaries and repeating exercises that help the dog practice control and self restraint will help Kevin start to see himself as being in a follower position. After I finished going over these changes and mastering the Leadership Exercise I developed, I had one of the family’s children go outside and play the part of a guest so I could demonstrate how to claim the area around the door before opening it. I apologize that the above video doesnt show my arms as I get to the door. I had one of the family’s children film that part and forgot to ask him to pan up. Basically the procedure is to break the door opening ritual into individual steps. So I stop after each step back to read the dog and when I get to the door, i giggle the deadbolt, then the door knob, then crack the door, then open it. I pause in-between each step and if the dog starts to come forward at any time I stop what Im doing and turn my full attention to the dog until it gets back behind the boundary I set earlier. After having the guardians watch me do it, it was time for them to practice the door answering ritual themselves. First up was the family’s mother. AT first the mother was too slow and timid in her movements for the dog to respect. Big bold movements work much better when applying this technique. Stopping short of the dog’s position, moving slowly or going side to side tells the dog you are not sure of what you are doing. Additionally her hiss sound was way too quiet and delivered too late. Essentially we are demoting the dog from this door security position. But most dogs will not give up this job until the human demonstrates they have it under control themselves. So it will be important for the mother to practice this over and over until she moves forward in bold, deliberate movements that the dog respects and responds to. One of the kids mentioned that Kevin would probably react differently if it was someone other than a family member at the door so once again I passed over my camera and headed out to play the part of a guest myself. Because we had practiced this new door answering procedure a few times, Kevin was already changing his behavior. You can hear the guardian giggling the door knob while Kevin stays in the middle of the family room at the start of the above video. When Kevin did approach the door, he stopped on his own at the boundary we established earlier, then moved away as soon as he was corrected with good timing by the guardian answering the door. Because he is so young, it shouldn’t be hard for Kevin to learn to behave at the door and accept correction from his guardians. The more that they practice the leadership exercise, pet the dogs with a purpose and enforce the new rules and boundaries, the faster the dog will change his behavior. Whenever I hear a client tell me they can’t believe how improved their dog’s behavior is, I know it was a good session. By the end of this one, Kevin’s had stopped his barking and other unwanted behaviors on his own. With some additional practice and good leadership from his humans, Kevin will adopt the follower mindset and leave door security up to the humans.